Indian summer is here. Of course it is! It always arrives when I have a chocolate shoot to finish. I think I’m done foraging for huckleberries (are we ever REALLY done, though?) and instead I’ve been gathering breakfasts, lunches, and dinners to tide Jeremy over the next 3 weeks while I’m on the fall shoot. It is time. The colors are starting and I’m getting that itch to hit the road. Since I have yet to pack my gear in addition to the 114 other things on my to-do list (let’s call it a to-do novella), I’m just gonna dive into the recipe and its backstory. My friend, Kathryn, was visiting us from Norway last month when we got on the topic of food. Actually, we never stopped talking about food – this is why we are friends. She had an obsession with Kona Grill’s angry edamame. More specifically, she had an obsession with the angry butter. I’ve never eaten at Kona Grill, nor have I ever had angry edamame, but it sounded good. It’s really all about the angry butter. So I did a quick Google search and found a list of ingredients as a handrail. 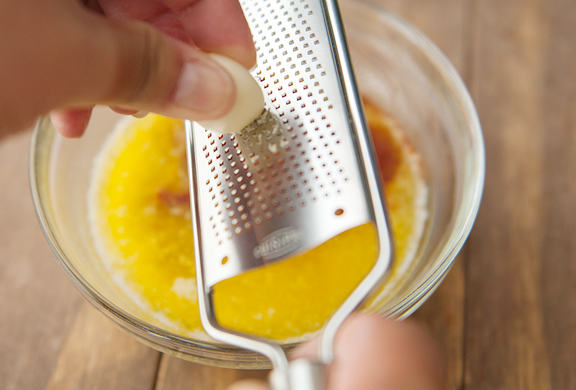 In essence, we are making a spicy, tangy, garlicky butter. How could this possibly be bad? I guess it’s bad that this is so darn easy and quick to slap together that you’ll want to slather it on corn, pan-seared scallops, roasted chicken, grilled asparagus, roasted Brussels sprouts… EVERYTHING. Make the angry butter first, because you want to add it to the edamame when it is steaming hot. 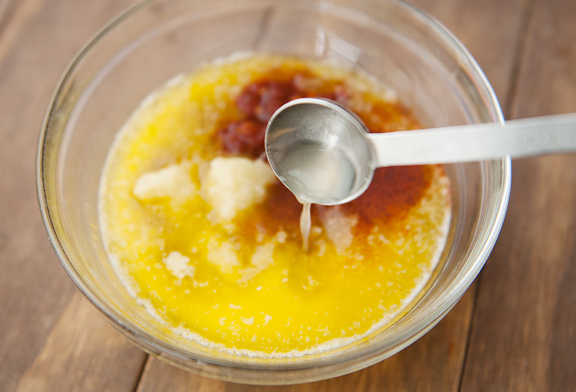 This way, the heat will help the butter get all melty and slide-y so that it coats the pods. The recipe yields about three-quarters of a cup of angry butter and I wound up with a pool of orange angry butter at the bottom of the bowl. 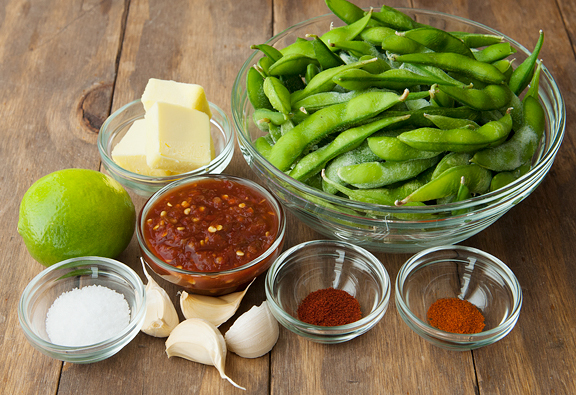 You may not want to use all of it on a package of edamame – maybe save some for later. If you enjoy some zing in your life (or your mouth) and aren’t afraid of butter (of course you aren’t, you’re reading THIS blog), try this. It’s got a nice punch to it without being overbearing. 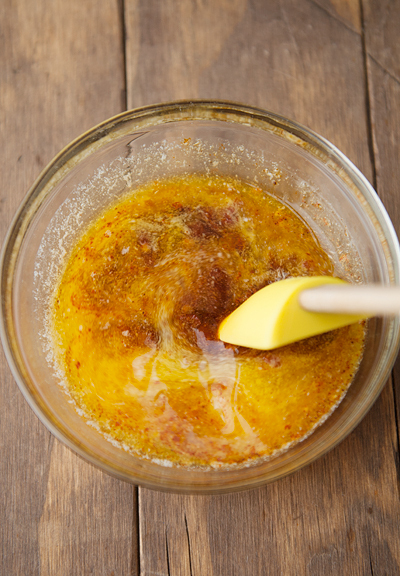 I like mine on the tangy side, so I added four teaspoons of lime juice which plays so well with the garlic and chiles. And contrary to the name, I’m pretty sure this angry edamame will make you quite happy. I’m waiting for Kathryn to get home from vacation to tell me if this comes close to what she had at Kona Grill. 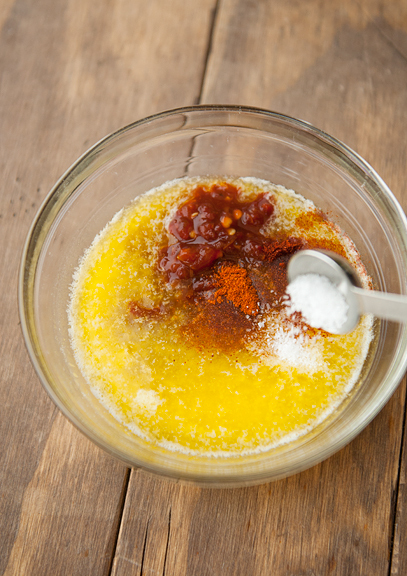 Make the angry butter: Mix the butter, garlic, sambal, salt, chile powder, cayenne powder, and lime juice together in a small bowl until thoroughly combined. Set aside. 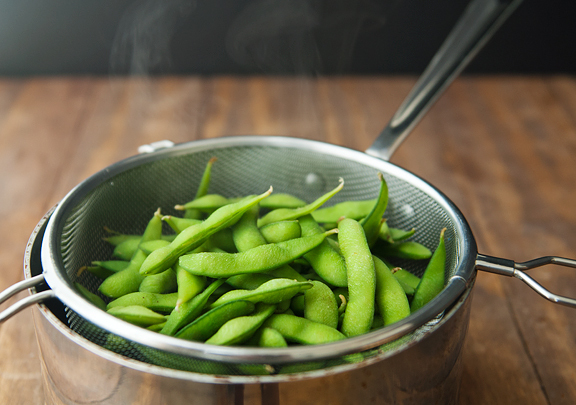 Make angry edamame: Bring 2 quarts of water to a boil in a medium saucepan over high heat. Add the edamame to the boiling water. Let return to boil and cook for 5 minutes. 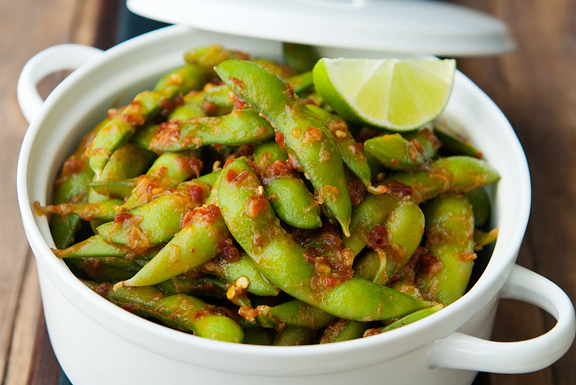 Drain the edamame and place them in a large bowl. 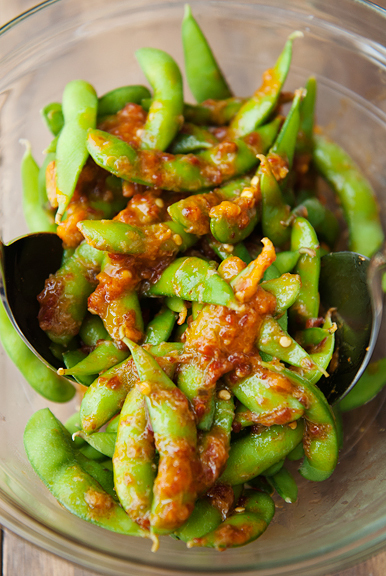 Toss the edamame with angry butter while the beans are hot. Serve hot. This edamame sounds lovely! That spicy sauce is calling my name! I’d love a bowl of these with an ice cold beer! Yummy. 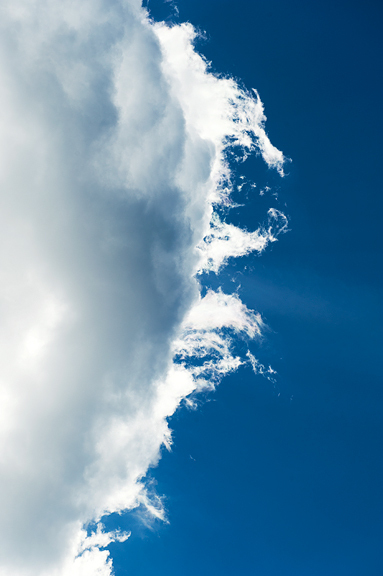 That cloud photo is a dream. It’s like artwork the way you framed it, and I could see it blown up and displayed as a main focal point in a bedroom. I love it! I have a few branches of fresh edamame in the fridge that’s been waiting for something really special. This is it! Thank you! This is my type of spicy food. I definitely will try it soon as I get to the market. It’d be a lovely afternoon snack. i’m going to get so angry later. TPH would absolutely love this. Will have to try next time. I tend to love mine just salted. Plain girl that I am. This would make me happy. I love love eating steamed edamames and this just sounds so darn good!! This sounds like the perfect snack. I love edamame! Katrina – it’s a nice twist on something I never thought to change! Christina – I hope you liked the recipe! Lisa – or a great appetizer. danielle – angry, happy, it’s all good, right? Ami – it’s a nice change of pace from a standard! 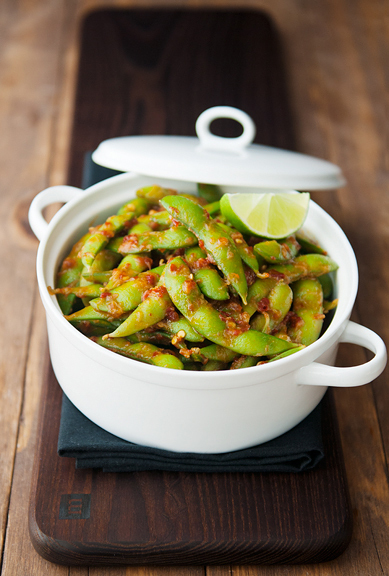 ATasteOfMadness – me too, and it’s great (although heavier than regular steamed edamame). molly – not according to their corporate flashcards. Made this just now! Found this recipe via Pinterest, although similar to Kona Grill, it does lack the same flavor. However, it is still very good and for a quick dressing on my edamame it is perfect! Next time I’ll cut down on the amount of butter and up the sambal.